In her first guest post for The Paranormal Scholar, Charlene of Ghosts of Britain discusses crop circles in the South of England and her experiences after visiting several over the summer. One place I have always wanted to visit is Stonehenge, so I decided to take a road trip out to Wiltshire, England to find out the mysteries that surround this fantastic monument. I expected to come back to write about Ley lines and the history surrounding this, but while visiting I found myself researching crop circles. I will stress I am not expert in UFOs, but the paranormal field isn’t just about ghosts and ghouls: it is all things paranormal (anything that is a mystery or unexplained – essentially, all which isn’t normal). That said, even crop circles have been linked to spirits by some. After researching Stonehenge, I came across many websites that connected recent and previous crop circles to this location. Fascinatingly, a lot of reported crop circles are indeed reported in Wiltshire. Crop circles have been reported outside this area of course, but Wiltshire tends to be the main hotspot for them. Are crop circles a hoax? Many people will think that crop circles are some kind of hoax. Many may believe that it is a farmer’s way of drawing attention to their farm, but after researching this, farmers are less than impressed when these things pop up in their fields overnight. Due to attention the circles attract, the farmer ends up at a massive loss in profit, sometimes a huge loss of up to £120,000. Whilst some farmers will allow access to view these circles, many do not. They just do not want the attention, as it can result in further damage to their crop fields. The ones that do allow you to view may put a donation box outside the field, but at a cost of £2 a person, this would not add up to the profit they would have made if they had sold the crops after harvesting. Crop circles are still widely considered to be one of the world’s biggest paranormal hoaxes. In 1991, hoaxers Doug Bower and David Chorley were filmed showing how they made many of the crop circles that had been discovered across the UK. Even so, this has not stopped people from believing. After all, in all aspects of the paranormal there will be frauds. It is worth noting that the formations from Bower and Chorley were nothing spectacular: the quality of them was poor compared to other formations. At the time, many believed the ‘confession’ of Bower and Chorley was a deliberate distraction to dilute interest in the real phenomenon that was, and still is, taking place. My thoughts are that people will produce fakes in whatever area within the paranormal you are interested in. Fakes will always be reported, but that doesn’t necessarily mean that all similar phenomena is fraudulent. Indeed, the confession of Bower and Chorley did not stop crop circles from being formed. 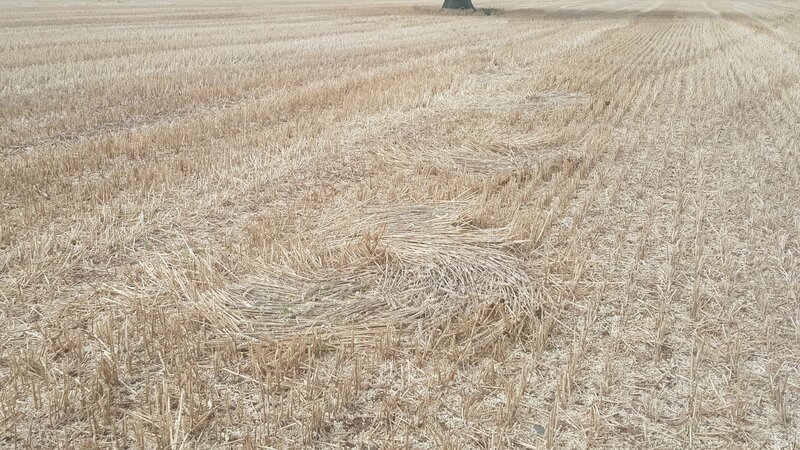 In fact, this year there has been an increase in reported crop circles within Wiltshire. 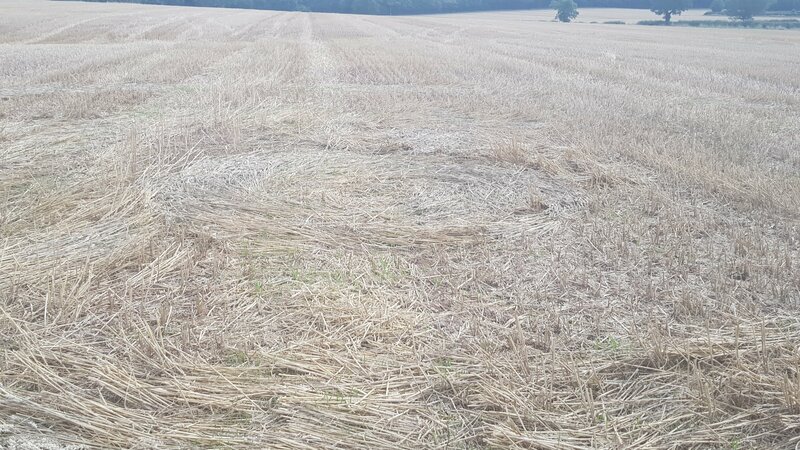 In response, police put out an official statement saying that it is a criminal offence to form a crop circle, and anyone caught will be prosecuted. As of yet nobody has been caught creating these formations this year, or previous years (asides from Bower and Chorley). I also find it extremely interesting that surrounding Wiltshire and Stonehenge are many military bases. On my travels I saw at least three all located with a ten mile radius of Stonehenge. From other cases, it seems to be the case that heightened UFO activity and government bodied areas go hand in hand. For example, Area 51 in America and the UFO activity reported there. Crop Circles are strange patterns that mysteriously form overnight in farmers fields. Whilst mostly found in the United Kingdom, they have been reported in dozens of countries around the world in past decades. Unlike other mysterious phenomena such as ghosts, psychic powers or Bigfoot, there is no doubt that crop circles do exist and are very real. The question is, what creates them? There are many theories and explanations, ranging from aliens making the patterns themselves, their space ships creating an energy to form them, precise wind patterns, time travelers, scientifically undetectable earth energy fields and meridians called Ley lines, spirits, humans and even – at the most ridiculous end of the speculation spectrum – sexually aroused hedgehogs. Many believe that a crop circle could be a message to us, from whoever is creating them. For this reason, when a crop circle is first reported, researchers go out to investigate. It is very rare that a crop circle will contain squares, triangles or rectangles. Undoubtedly, circles dominate. As well as circles, some may have straight or curved lines. Sceptics have suggested that a circle is the easiest form for a hoaxers to create. Whilst it has been reported, it is very rare for a circle to appear in daylight hours. Sceptics say that this is because nighttime is the best time for a hoaxer to make the circles without being seen. Yet, I have to point out how extremely difficult it would be to create these formations in pitch black conditions, given their intricacies and fine details. Crop circles usually appear in a field that is easily accessible by the public. It is very rare that one will appear in a remote field, which seems to evidence the belief that these formations are messages desired by their creator to be read. On 21st August, 2017, a total eclipse was visible with a large band across the USA. In the south of England, the eclipse was partially visible. On 17th August, only a few days before, a crop circle was reported in field near London Southend Airport. Bizarrely, this circle seemed to foreshadowing the coming eclipse. In response, many theorised possible meanings interpretations, suggesting that the circle contained a message. 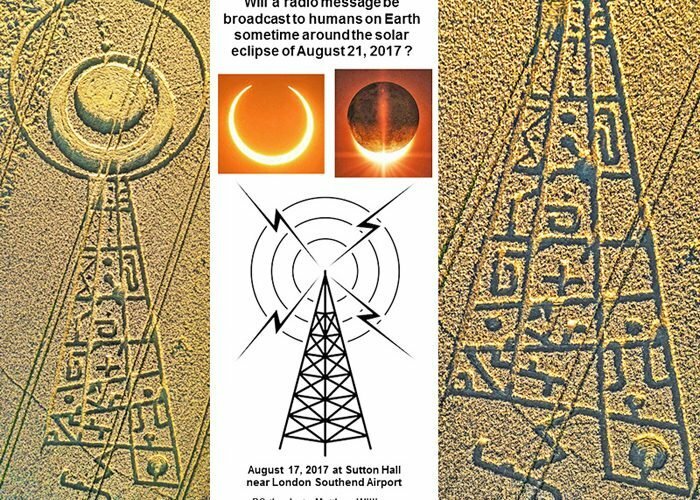 One theory suggested that a radio message would be broadcast to humans on Earth sometime around the time of the solar eclipse. Certainly, the crop circle did appear to show the partial eclipse witnessed by people in the area only a few days after the formation appeared. It is suggested that crop circles have been appearing for centuries. Throughout the years, farmers have reported strange shapes appearing in their fields. Due to the fear or supersaturation, many of these were not formally reported, instead being passed down in oral tradition. However, there is evidence to support the history of these reports. Sometimes cited as the first piece of evidence of such formations is an English woodcut pamphlet published in 1678. It appears to show a field of oat stalks laid out in a circle. 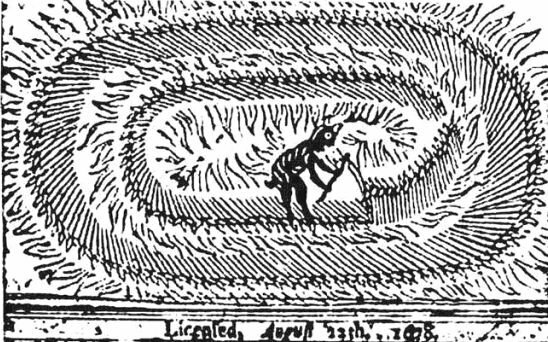 The Mowing Devil pamphlet (1678). The pamphlet tells of a Hertfordshire farmer who refused to pay the price demanded by a labourer to mow his field. The farmer swore that he would rather that the devil mowed it himself. According to the 17th century pamphlet, that night his field appeared to be in a flame. He woke the next morning to find the field perfectly mowed “that no mortal man was able to do the like”. The first photograph of a crop circle was taken in 1932, at Bow Hill, near Chichester, West Sussex. A large proportion of crop circles appear more regularly in and around an area that has become known as the ‘Wessex Triangle’, the triangle’s cardinal points being, Silbury Hill, Warminster and Winchester. The triangle boasts the presence of two of the largest stone circles: Avebury and Stonehenge. This region is also surrounded by burial grounds, many of which are circular. Silbury Hill, which is also circular, is the largest man-made earth work in Europe. Its source and purpose is a complete mystery, like the crop circles which are often found close by. 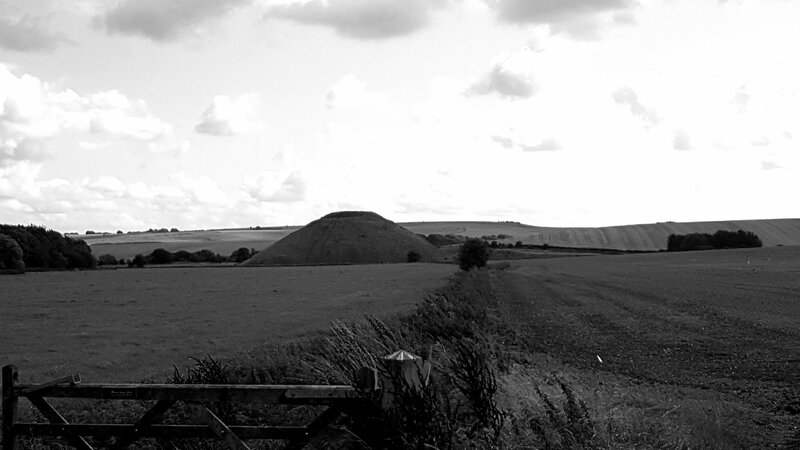 It could be said that Silbury Hill acts as a centrepiece of sorts for them. Silbury Hill, the largest man-made earth work in Europe. During my visit to the area, I stopped at Milk Hill, Alton Barnes. The highest point in the county of Wiltshire, this is the location of the Alton Barnes white horse, a hill figure cut in 1812. Once again, this location is also known for having produced many crop circles. Some people have even reported seeing balls of lights and other strange occurrences in this area. Below is some footage captured on 29th July, 1990. It claims to show a ball of light close to two crop circles near Milk Hill. The man filming at the time, Steve Alexander, stated that he saw the intense ball of light drop into the crop. Interestingly, Alexander was not the only witness. A tractor driver also saw the ball of light. 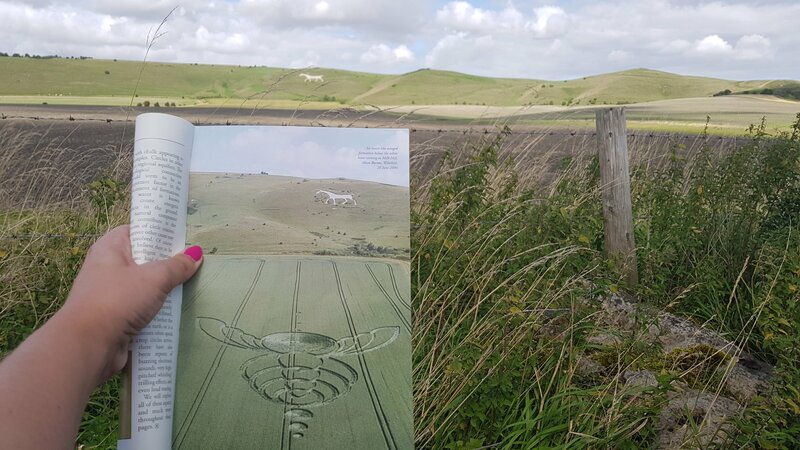 As you see from the picture in this book I have, this circle would have sat in the field below the white horse. A formation of a winged insect was found on 26th June, 2014. Entering a crop circle can be an exciting, hypnotic and mysterious experience. Of course, it doesn’t come without a warning. For those who have entered, some have reported experiencing many physical and mental effects. Often, it seems that this is somehow dependent on the pattern of the formation and the individual. Feelings can range from elation, to peacefulness to nausea, as well as headaches, disorientation and panic. Some people have reported electrical tingles and other strange sensations within the circles. Miracles and healings have also been reported, as well as sudden declines in well-being and menstrual cycles being disrupted. Electronic equipment seems to malfunction when taken inside a formation. For example, there have been regular reports of mobile phone batteries draining and cameras failing. There has also been reports that compasses and other magnetic devices experience strange effects. Farmers have also reported combine harvesters breaking down when attempting to cut the crops. The fields opposite Stonehenge tends to be very popular for crop formations. Below is some footage taken by MegalithomaniaUK of a circle reported on the 8th July, 2016. The appearance of the circle marked the 20th anniversary of the famous ‘Julia Set’ formation, which appeared on 7th July 1996 in the same field. The Julia Set was 915 feet long, and consisted of 151 circles. What makes this particularly interesting is the form of the circles. It was a series of complex fractal shapes, meaning it made us of a self-replicating pattern which results from natural reiterative equations, as generated by computers. The Julia Set was reported by a pilot, who flew over the same field twice in one day. On the first flyover the formation was not there. On the second, a mere 45 minutes later, it was. Even more strange, this was said to have formed during daylight hours, believed to have been created in a 45 minute slot. In full view of Stonehenge, in front of a busy road, with nobody reporting to have seen someone doing it – a mystery indeed. 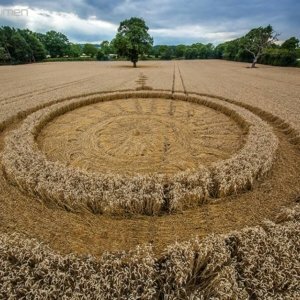 On 4th August, 2017, a large circular crop circle was reported in Hannington, Wiltshire. I was able to visit for myself on the 18th. There was a donation box left by the farmer for those who wished to visit. However, the circle was not easy to find, as the farmer drew no attention to it being there. The reason why she eventually opened the field up to the public was due to the level of interest. As people had been visiting in their 100s, some of the farmers other crops were damaged by their trespassing. Below is my own footage inside the crop circle. When I stood in the centre I experienced dizziness, heightened emotions and sickness. The circle prior to harvesting. Another crop circle to be reported this summer was found in a field in Monarch’s Way, Nr. Wootton Wawen, Warwickshire. Reported on 7th August, I was able to visit on the 20th. Unfortunately for me, the farmer had already harvested the remaining crop, so the depth of the circle wasn’t so clear. In my pictures, you can still see the outline of where it was. Upon comparing this crop circle to the previous one I saw during my visit to Wiltshire, they appeared to have similar characters. Both had a weaved effect to them, like a blanket, rather than just a flattened texture. These weaved swirls are more apparent in my second picture. I would guess it would have taken some time to achieve this effect. Whilst in this circle, I experienced disorientation, and the feeling that everything appeared closer then it was. Below is overhead footage captured by Matthew Williams of the Wootton Wawen crop circle. To view the latest crop circles, and find out whether or not you can access the sites, please visit Crop Circle Access. This article was first published on Paranormal-Magazine. 12 Creepy Ghost Photos…Not Yet Proven to be Faked!